DETROIT – The all-new 2013 SL continues a tradition that began 60 years ago. For six decades the letters “SL” have been synonymous with a blend of sport, style and comfort – infused with groundbreaking innovation. For the first time, the SL is being produced almost entirely from aluminum and consequently weighs considerably less than its predecessor. Its highly rigid all-aluminum bodyshell provides the basis for agile, sporty handling that has been taken to an entirely new level, coupled with outstanding bodyroll and ride characteristics. Even better driving dynamics come courtesy of the new direct injection engine, which is more powerful and economical than the outgoing generation. Other new features include the unique Frontbass system, which turns the luxury sports car into a concert hall – with the top down or up – and the highly efficient MAGIC VISION CONTROL. The 2013 SL550 will be available in U.S. showrooms this spring. Compared with its successful predecessor, the 2013 Mercedes-Benz SL offers considerably more comfort and athletic character, setting new standards in the luxury roadster class. This includes amazing everyday usability, making the SL the most versatile of all sports cars. In short, anyone talking about the new SL is surely talking about the ultimate in passionate, refined motoring. 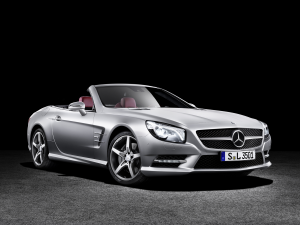 The 2013 Mercedes-Benz SL takes the meaning of the famous letters “SL” – super lightweight – quite literally. Weight reduction across the board is one of the most outstanding design characteristics of the new SL, as was the case for its namesake, the original SL of 1952 with its lightweight tubular frame. For the first time, Mercedes-Benz has implemented an all-aluminum bodyshell in a seriesproduction model. Only very few components are made from other materials. The designers used even lighter magnesium for the cover panel behind the fuel tank and roof. High-strength steel tubing is integrated into the A-pillars for added safety. In terms of rigidity, safety and comfort, the aluminum structure is superior to the previous model’s steel construction. One contributing factor is its intelligent lightweight construction with components optimized for their specific task. As a result, diverse processes are used to make different kinds of aluminum depending on component use. The parts are made by chill casting or vacuum die casting, worked into extruded aluminum sections or into aluminum panels of varying thickness. The outcome – high rigidity and excellent safety combined with low resonance and vibrations. The new SL is even more comfortable and has more assistance systems on-board than its predecessor, sacrificing some of the weight saved through the aluminum bodyshell as a result. Nevertheless, the scales show some astonishing readings – the 2013 SL550 weighs around 275 pounds less than its predecessor. 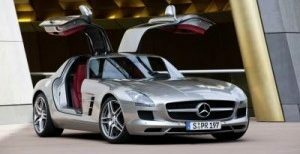 This is due to a host of other intelligent details that Mercedes-Benz has also implemented in the new SL in addition to the aluminum bodyshell. Powerful acceleration, effortless at all speeds, nimble on winding roads – the new SL delivers outstanding driving pleasure. As well as a powerful engine, the SL550 boasts a fine suspension that is both sporty and comfortable, and also features intelligent lightweight construction. The steering knuckles and suspension arms on the front axle, for instance, are also made from aluminum to reduce the unsprung masses. The same applies to virtually all the suspension components on the rear axle. The new SL is available with two different suspension systems – with the Agility Control Suspension as standard equipment. The ABC (Active Body Control) suspension system is available as an option. Both suspension variants are combined with a new electromechanical Direct- Steer system featuring speed-sensitive power steering and a ratio that can be varied in accordance with steering wheel angle. This provides excellent directional stability and safety when traveling at highway speeds, and adds to the SL’s agility. It also reduces the amount of steering effort required when parking and maneuvering. The new V8 in the SL550 develops 429 hp from its displacement of 4663 cc, which is around 12 percent more than its predecessor despite some 0.8 liters less displacement. Fuel consumption has been reduced while at the same time the torque has increased from 391 lb-ft to 516 lb-ft – a gain of 32 percent. The engine features an ECO stop/start function as standard equipment, while the 7-Speed Driver-Adaptive automatic transmission has been optimized for fuel consumption and comfort. The fuel economy of the direct injection engine does not detract in any way from the roadster’s sporty character. Quite the opposite in fact – the SL550 takes just 4.5 seconds from 0 to 60 mph – eight tenths less than the previous SL550. The 2013 SL combines its finely honed profile with a luxurious feel. Premium materials, perfectly finished with great attention to detail define the style and character of the interior. Compared with its predecessor, the new-generation SL is much longer (+1.97 inches) and wider (+2.24 inches), providing more room for greater comfort in the interior, too. Shoulder room (+1.46 inches) and elbow room (+1.10 inches) have been increased, exceeding the norm for this class of vehicle. Clear lines create a coherent look & feel in this comfortable interior. A generous sweep of fine wood trim extends from the center console across the dashboard into the doors, creating a pleasant wrap-around effect. A choice of two wood trims is available. Perfectly in tune with the roadster’s character, the interior combines the unpretentious atmosphere of a high-performance sports car with the comfortable, stylish ambience you might expect from a luxurious touring car. The designers have brought the latest generation of the SL to life with a firm foundation in tradition, but with new perspectives and visions. The result is a stylishly sporty and elegant luxury sports car with balanced proportions that are classic SL. The long hood gives way to a compact passenger compartment that is set well back. A wide, powerful rear end with a strong racing character provides the finishing touch. Just a few carefully drawn lines define the powerfully sculpted, yet calm surfaces along the flanks. Finely crafted details, a striking rear end plus ventilation grilles with chromed fins from the dynamic tradition of the Mercedes-Benz heritage evoke the SL legend. An upright classic sports car radiator grille clearly identifies the new SL as a prestigious member of the current Mercedes-Benz sports car lineup. The centrally positioned star is a contemporary reinterpretation of the famous trademark, and now extends into the center section with its organically flowing contours. Dynamically slanting headlamps set well to the outside frame the striking front end and give the new roadster its own unmistakable face. The Bi-xenon headlamps come with active curve illumination and corner illuminating lamps as a standard feature, as well as Adaptive Highbeam Assist. With different lighting functions tailored to typical driving and weather conditions and activated in accordance with the driving situation, they offer the driver a much better illuminated field of vision. The striking sidelights and the horizontal line of the daytime running lamps in the far ends of the bumper feature LED technology. The sixth generation of the SL also offers a retractable hard top that can be operated using a space-saving electrohydraulic mechanism, converting the SL from coupe to roadster and back again in a matter of seconds. In contrast to its predecessor, the new SL offers two versions of the retractable hard top – glass or the unique panoramic roof with MAGIC SKY CONTROL. The transparent roof switches between light and dark at the push of a button. In the light setting it is virtually transparent, offering an open-air experience even in cold weather. In its dark state the roof provides welcome shade and prevents the interior from heating up in bright sunlight. The frame of both versions is made from magnesium, reducing weight by around 13 pounds compared with the outgoing model, lowering the vehicle’s center of gravity and delivering greater agility. The engineers have refined the operating mechanism for the roof and trunk lid. It now takes less than 20 seconds to open or close the roof completely. virtually no accumulation of dirt on the side windows. MAGIC VISION CONTROL is a new, intelligent and highly efficient wipe/wash system. The innovative wiper blade judiciously dispenses wash fluid just in front of the wiper blade via channels integrated into the blade – in both directions of travel. The result is no water splash on the windshield to disrupt driver visibility and a perfectly clean windshield. The water also stays on the windshield, with no risk of overspray into the passenger cabin when the roof is down. A fully heated wiper blade is included as standard equipment, preventing the build-up of snow and ice on the blade in winter. This heating function also allows warm water to be applied directly onto the windshield for the first time, even in cold temperatures. Equally unique is the Frontbass system, which makes intelligent use of the spaces in the aluminum structures forward of the footwell. These spaces function as resonating chambers for the woofers and mark the first time ever that a sound system has been integrated into the body-in-white. As a result, the new SL features clear, rich bass sounds that deliver a concert hall ambience even with the top down. The new layout has the added bonus of freeing up space in the doors and interior. Both innovations are part of the extensive standard equipment of the new SL. The HANDS-FREE ACCESS system is another Mercedes-Benz innovation that provides easy, hands-free operation of the trunk lid. The driver simply moves their foot in the vicinity below the rear bumper. Mercedes-Benz is the only car maker to offer a system that not only automatically opens the trunk lid but closes it as well. The SL is the world’s safest roadster, thanks to the collision-optimized aluminum structure, standard equipment that includes PRE-SAFE® and ATTENTION ASSIST, plus further assistance systems on the same high level as the S-Class. The rigid aluminum bodyshell forms a sturdy passenger compartment along with precisely defined deformation zones at the front and rear ends. The passenger compartment is protected in the event of the vehicle overturning by two roll-over bars and A-pillars made from a mix of steel and aluminum. The restraint systems including the two-stage driver and front passenger airbags have been further developed, while a head airbag covers the side impact area. An additional thorax airbag in the seat backrest protects the upper body in the event of a side impact. Another new feature is the crash-responsive NECK-PRO head restraints developed by Mercedes-Benz which are also standard equipment in the SL. One safety highlight in the standard equipment package is the unrivalled anticipatory occupant protection system PRE-SAFE® developed by Mercedes- Benz. If the system detects the imminent threat of an accident, it reflexively activates precautionary protective measures for the vehicle occupants, ensuring that the seat belts and airbags are able to provide maximum protection during an impact. Additional post-impact measures supplement the integral safety concept and facilitate rapid assistance. Regardless of the severity of the impact, the doors are automatically unlocked after an accident, the interior lighting is activated and the side windows lowered by 2 inches to ventilate the interior more effectively. The steering wheel also moves upward. A unique combination of driver assistance systems in the new SL helps prevent accidents. These include the drowsiness detection system ATTENTION ASSIST and the ADAPTIVE BRAKE, both of which are standard equipment. The latter features ABS, acceleration skid control (ASR) and active yaw control, and offers comfort and convenience functions in addition to safety features. Optional equipment includes DISTRONIC PLUS adaptive cruise control with PRESAFE ® Brake, which is already well proven in other Mercedes-Benz models. The systems use radar sensors to detect the serious risk of a rear-end collision. The PRE-SAFE® Brake warns the driver and can initiate autonomous braking if the driver fails to react, thus either preventing the accident or at least mitigating its severity. PRE-SAFE® can also activate occupant protection measures. Active Parking Assist is new in the SL. Using ultrasound sensors it can identify parking spaces and automatically steer the vehicle into the selected space. COMAND with Internet access capabilities and DVD changer is standard equipment in the new SL. It provides Web browsing while the vehicle is stationary, along with access to Mercedes-Benz Apps – such as Google Local Search, Yelp and Facebook – with a paid subscription to Mercedes-Benz mbrace2 in-vehicle connected services after the complimentary trial period ends. There are also the options to send individual routes to the vehicle from Google Maps and destinations from iPhone® and Android® phones using the Mercedes-Benz mbrace Mobile App. The COMAND system features a high-resolution 7-inch TFT color display (800 x 480 pixels) next to the instrument cluster. This screen arrangement helps to avoid driver distraction. The 2013 SL550 will be available in U.S. showrooms this spring. To coincide with the launch of the 2013 SL, Mercedes-Benz will also be offering a special-edition model, the “Edition 1”, for a limited period. The “Edition 1” is superbly equipped and comes standard with AMG 19-inch alloy wheels, designo exclusive leather with contrasting topstitching, AIRSCARF, the Harman/Kardon® Logic7® surround sound system and much more. The designo crystal silver magno special paintwork is available exclusively for the “Edition 1”. Interior upholstery is designo classic red/black exclusive with designo black piano lacquer wood trim.